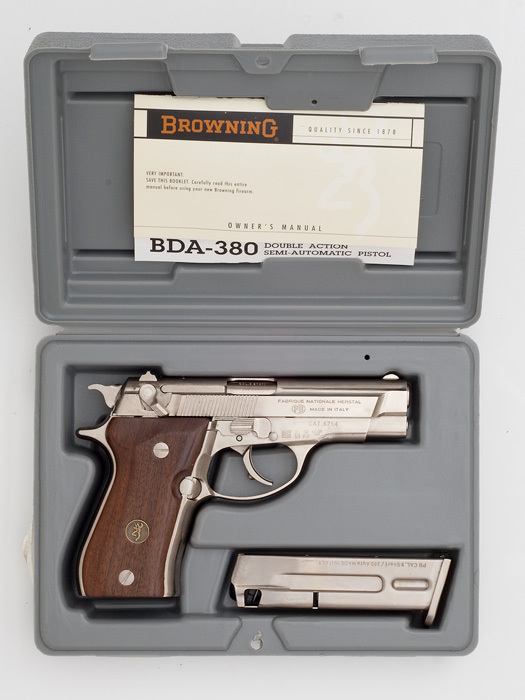 UPDATE: Photos of my Browning BDA .380 click here. I stopped by my favorite local gun store here in Lakewood, WA - Surplus Ammo and Arms to pick up my new double barrel shotgun (more to come re: the shotgun). I was browsing the display case, waiting for the always fabulous and courteous staff to process my paperwork and background check, when I spotted a shiny glare out of the corner of my eye. Slightly hidden under the gun cleaning mats and the lap top computer which sits on the display case (used to expedite background checks), was a gorgeous looking hand gun which at first glance appeared to be a Beretta 84FS Cheetah (pictured below). I had been itching to buy this hang gun for the last couple of months, having first spotted one in the display case at the new gun counter at the PX on Joint Base Lewis MCChord, but the price tag prevented me from making the purchase. 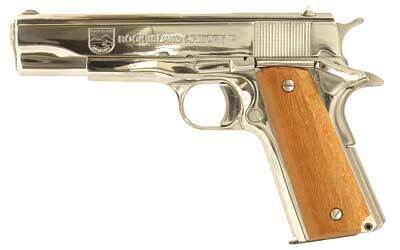 I recently saw one on Gun Broker for around $850. I've been wanting to add a flashy, nickel plated hang gun to my collection and this Rock Island 1911 seemed to fit the bill, but now I had to seriously consider the Browning BDA which I was holding in my hands. I asked the manager at Surplus Ammo and Arms if he would hold it for me until the next morning. The time was now 5pm and I had to get to Mary's by 6pm. Aaron, was nice enough to hold it for me until 11am the next morning, but as it turned out, he didn't have to hold it that long at all. I made the short drive to Mary's Pistols, dragging my friend and army veteran and his dog Molly, along with me on my gun browsing adventures. Mind you, this all started with the simple errand of picking up my new shotgun. We arrived at Mary's and I took my time looking at the Rock Island 1911. 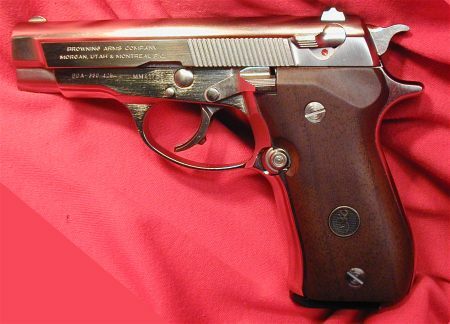 If it looked anything like the gun in the above photo, I probably would have bought it, but it looked used and slightly worn, which would be totally acceptable had it been a used gun, which I thought it was. But as it turned out, this Rock Island was brand new! I would have never guessed. 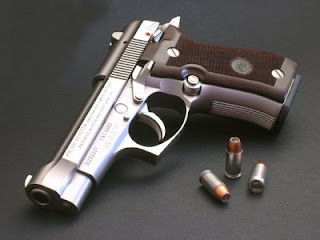 I might still buy one next year, but looking at the time on my cell phone, I realized I could make it back to Surplus Ammo and Arms before closing time to put a down payment on that Browning and that's exactly what I decided to do. We drive back to Surplus Ammo and Arms, enduring a heavy rain and poor visibility on the wet and sometimes flooded roads (I really wanted this gun) and made it back just before closing time. As we walked in, I one of the sales man says to me, "So you're the guy". I look over at him curiously. What was he talking about? He continues, "I was going to buy that gun for my wife for Christmas". Well, my heart sank a little because I could vision how excited she might have been if she were to get that Browning from her husband as a Christmas gift. I offered to pass up on my purchase so that he could have it but he humbly turned down my offer. He went on to admit that he erred and should have set it aside for himself earlier and that he had tried his best to put it in the display case in a somewhat inconspicuous location, in the hopes that no one else would buy it. As luck would have it, this is exactly the type of high-quality concealed carry hand gun that I have been wanting to add to my collection. We left it at that, his wife would not be getting it for Christmas, poor Rob. One of the things I enjoy most about the sport of shooting and the hobby of gun collecting is the camaraderie. It's a rare occasion that I don't meet someone new on each trip to the range or the gun store. 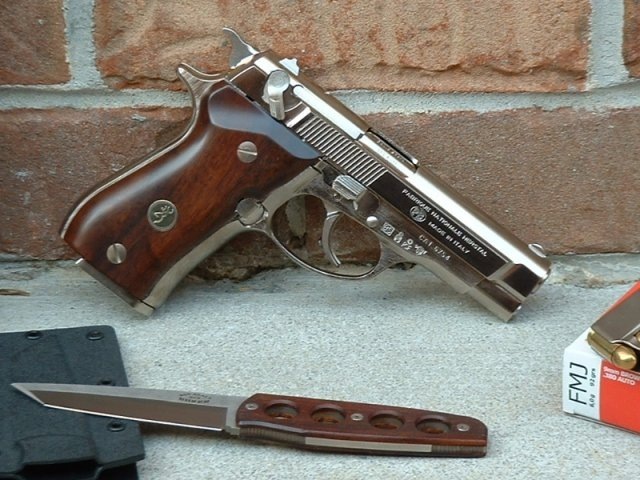 I enjoy letting others shoot a few rounds with my guns and most everyone is inclined to reciprocate. 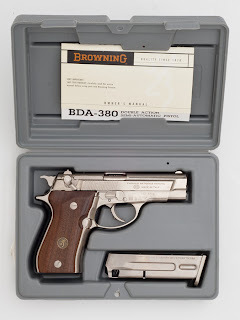 So in the spirit of that gun lovers camaraderie, I thought it'd be nice to give a Christmas gift to Rob's wife, to ease the pain of missing out on that beautiful Browning BDA .380 that she would not be getting this year. I had purchased a Spa Day package that as fate would have it, I no longer had use for and therefore would be perfect to hand over to Rob so that he could give it to his wife. It's a gift certificate good for two spa treatments at a local upscale spa. I get (one of) the gun of my dreams, she gets a day at the spa. I assured Rob that we would go out to the range together sometime and enjoy shooting the Browning, his wife is welcome to come as well. Honoring Vietnam Veterans - Thanks Richard! Video - Will the AR15 Survive?